Yukon Blonde are a dependable band to have in a festival line-up. People know them, they like them. They're fun and upbeat, and yesterday they were clearly happy to be in Yellowknife and having a good time on stage. But the dependability of a good reputation comes with the risk becoming unmemorable. The BC trio whipped through their set with the ease of a local watering hole cover band. While the people were happy to party to their music, one self-professed Yukon Blonde fan said she wished they had played their more up-tempo tunes. I had no qualm with the tempo (they certainly didn't have the beer garden crying in their beers), but I wished they had interacted with their audience more, if only to create those moments for the crowd that make it easy to believe the greatest party in North America is happening on this rocky sub-arctic outpost. 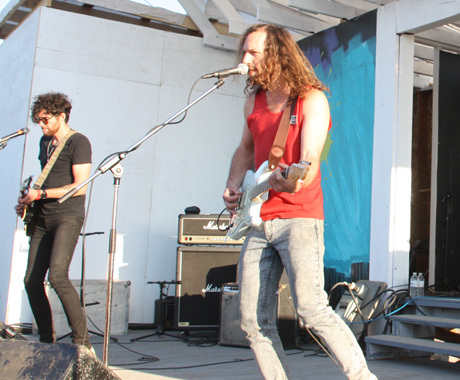 Despite these criticisms, Yukon Blonde had a good portion of the Palm Bay day-drunk kids in the beer garden up on their feet. They were good, not great.